Agile Methodology and its uses. Software development, according to Wikipedia is the process of computer programming, documenting, testing, and bug fixing involved in creating and maintaining applications and frameworks involved in a software release life cycle and resulting in a software product. It is a very long and complicated process. This process needs a set of principles to help in the development. Such one set of principle is Agile Methodology. Agile Methodology, in simple words is a software development methodology which builds a software in 1 to 4 weeks. This is done to make changes in the development process aligned with the changes in the business market. There is a constant feedback process and then the product is released after 1 to 4 weeks. 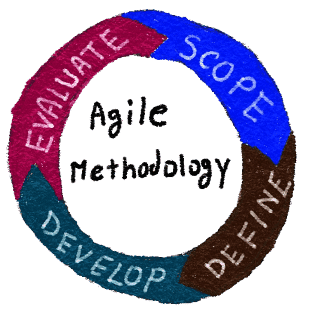 Agile Methodology has various counterparts which share most of the same philosophy and characteristics but each has its unique features distinguishing them from each other. A few of the main contenders are Scrum, Kanban, FDD, DSDM, Crystal, Lean, ASD and XP. Agile methodology has a iterative approach and after each iteration a software build is given out. Each build includes certain features, with the last build containing all the features the customer requires. Each Agile has a Scrum Master, a product owner and a cross functional team. While the Scrum Master and the Product owner are a part of Team interface, the rest are the part of Technical interface. The working of an agile team is divided into iterations to deliver user stories. Each story is planned based on it backlog prioritization and size. The whole team plans based on the capacity and number of hours they can contribute. Based on these, when the work is done, the team decides what “done” means. Once all the criteria have been met, the product is delivered to the customer and then they check if all requirements were met. Gulf State Software fully uses Agile methodology for product development. We always update our customers at production state. So sudden change can’t be big matter in our project management. To learn more about SDLC process click this link.